The dealer’s restriction in Bonus Blackjack is that he has to hit on a soft 17. Splitting rules are as follows: you can re-slit up to three times. Splitting aces is fine, but if you get a 10 point card on top of a split ace it counts as 21, not blackjack. Finally, aces can be split only once, whereupon you get one more card on each and then you must stand. You can double down on any two cards first dealt to you, or after a split. Double down wagers must equal 50% of your original bet. If you have blackjack, you lose the right to double down. If you double down or split, you cannot take an insurance bet. 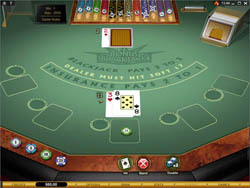 Otherwise, insurance bets pay 2:1 if the dealer gets blackjack, but if the dealer does not, you lose your insurance bet. Again, the rules are basically standard, but the one thing that is missing – this is important to keep in mind – is that you cannot surrender. Bets can be anywhere from 1 to 500 USD/GBP/Euro per round. Chips come in 8 different denominations, so it is very easy to bet exactly how much you want. A winning hand – that is, a hand that is closer to 21 than the dealer’s – pays out at 1:1. Blackjack pays out at 3:2, and if you took insurance on the dealer’s hand and the dealer gets blackjack, you get paid out at 2:1. The Bonus Bet can pay out as follows: Any 2 suited cards dealt to you pay out at 5:2 on your Bonus Bet. If your first 2 cards are a suited jack and ace it pays out at 25:1. Finally, jack and ace of spades pays out a huge 50:1. These payouts are in addition to the standard payouts, and are calculated based on the amount of your Bonus Bet. Microgaming’s Gold series games never disappoint, and Bonus Blackjack Gold is no exception! The isometric view is quite realistic, and gives you a perfect overview of the whole table. The realistic, colorful graphics are easy on the eyes, and all of the animations built in are very subtle, so there is nothing flashy to distract from playing. Gameplay is great too, with big buttons that pop up when and where you need them, and a very intuitive, easy to navigate interface system. To see the game rules, just move your mouse over the ‘rules’ box on the top of the screen, and they magically fade into view! Overall, this game gets five stars for graphics and gameplay. Pay close attention to the dealer’s face-up card, and let this guide your actions. Your goal is not always to come as blindingly close to 21 as possible, but rather to come closer to 21 than the dealer. You can make an educated guess about the eventual total of the dealer’s hand based on that one card, and on what other cards have already been played. Bonus Blackjack (Gold) is a great 2 deck game, and is equally well suited for beginners and advanced players. Since this is a single player game, it’s just you versus the dealer, so you can take your time and don’t need to worry about what other players are doing. The optional Bonus Bets offer more ways to win. With slick, realistic graphics and awesome animation sequences, this game is definitely top notch!